I’ve always has a fascination with games that put you in the role of an adventurer entering a dungeon to fight monsters and discover treasures and magical items. Starting with the original Dungeons & Dragons back in the early 80’s, this quickly evolved to playing many hours of Wizardry on our Apple II+. To this day Wizardry is still one of my favorite video games, having the perfect mix of adventure, rewards and the need to use your imagination. This fondness has spilled over into my kids, who also enjoy the “fog of war” in games where you don’t know what lies ahead on your path. The storytelling in Folklore: The Affliction encourages us to set it up on game night on a regular basis. Masmorra: Dungeons of Arcadia is one we use to introduce newer players to the genre, thanks to its chibi-style pre-painted miniatures. And up until now whenever we’re looking for a portable solution, we’ve relied on Boss Monster to provide the experience of moving forward through a dungeon on our way to battle the end boss. 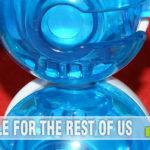 Why do I claim “until now”? 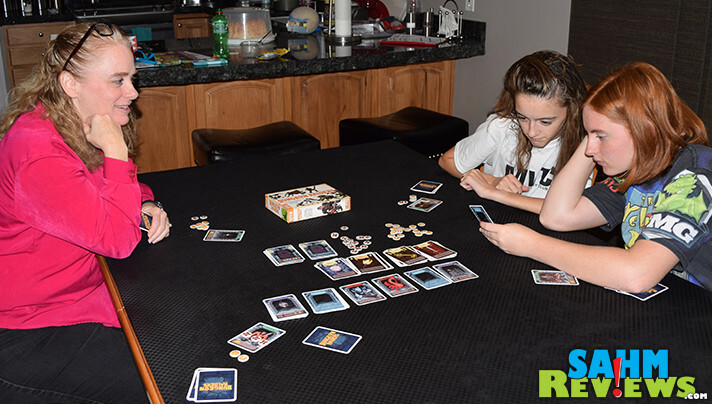 At this year’s Gen Con convention in Indianapolis, we got to demo a brand new card game by Devir Games, Dungeon Raiders. While most dungeon crawling games have you working together as a team, this game takes it to another level. You must still work together to defeat monsters, but the ultimate winner will be the adventurer who brings home the most gold! 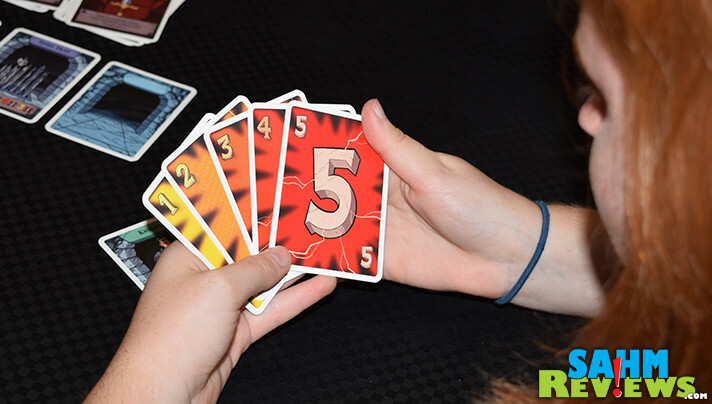 At the beginning of the game, up to five players each receive a randomly-chosen character card that will determine their staring items. This will range from gold coins to pre-existing wounds to items that could help them in the dungeon. 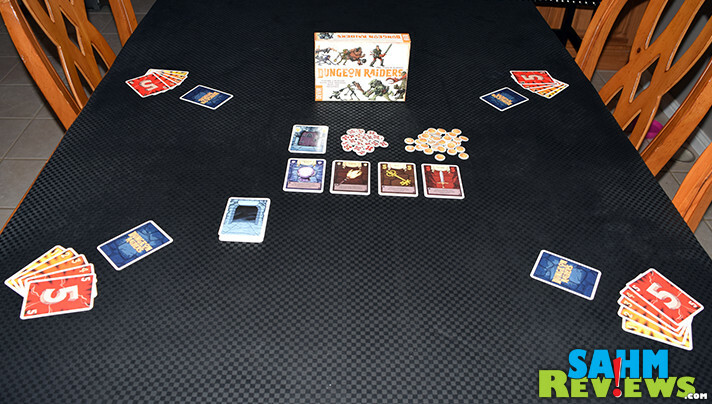 Players will take on the role of an Explorer, Knight, Thief, Warrior or Wizard and if playing with less than five, extra character cards are returned to the box and are not used. 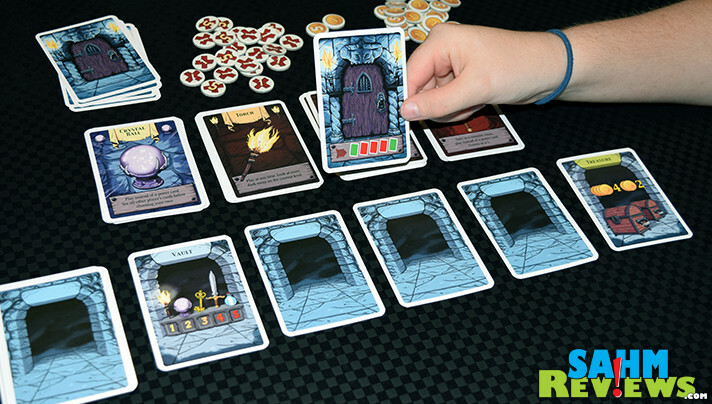 Dungeon Raiders is played over five rounds, representing the five levels of your dungeon. 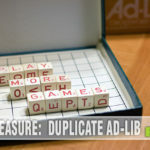 Each level contains five rooms whose type is signified by Room Cards. These are dealt out either face-up or face-down, depending on the layout represented on a randomly-drawn Level Card. 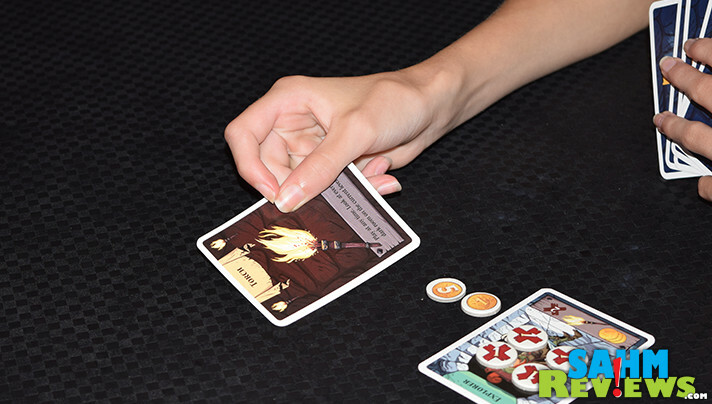 Each player is also given a set of five Power Cards which are kept secret from the other adventurers. The party moves through the dungeon from left to right, entering the rooms one by one. Upon entering a room, the Room Card is turned face-up (if necessary) and the room type is discovered. 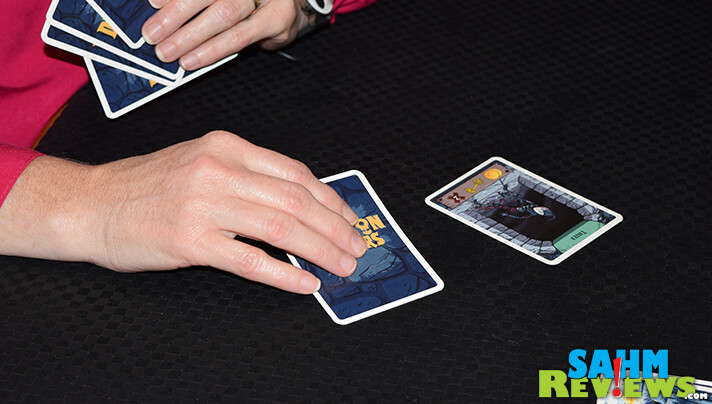 Each player chooses a Power Card from their hand and lays it face-down in front of them. Once everyone has chosen their card, all are flipped over simultaneously. Which card you choose will be determined by the type of room and your goal for that session. Treasure Rooms award its bounty to the person playing the highest numbered card, while Monster Rooms deal wounds to the person who played the lowest Power Card unless the party can defeat it. Vaults reward explorers depending on which card they play, and Trap Rooms may cause you to lose coins or receive wounds, again matched up with your Power Card value. At the end of the fifth level of Dungeon Raiders you will find the Boss. 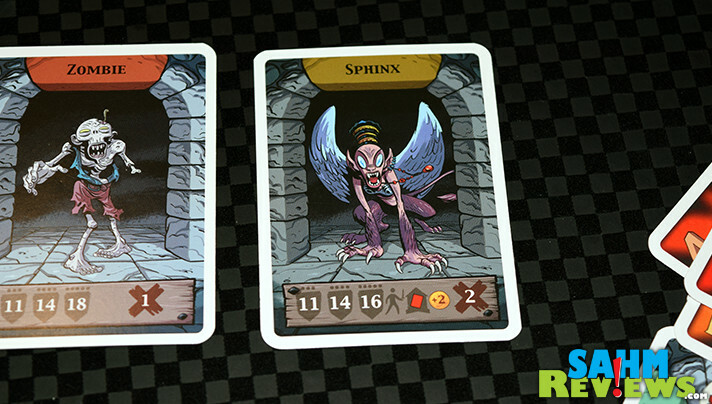 During setup, one boss was randomly selected from a pool of ten possible and placed face down at the bottom of the Room Card deck. Some may be defeated like regular monsters (their health is determined by the number of players), while others are immune to all attacks. None of the bosses carry any treasure to win, and all will potentially wound you or cause you to drop coins. When the fifth level is complete, the game of Dungeon Raiders is complete and final scoring commences. The adventurer with the greatest number of wound tokens collapses from their wounds and cannot win the game. If more than one player is tied for most wounds, they all succumb and are eliminated. 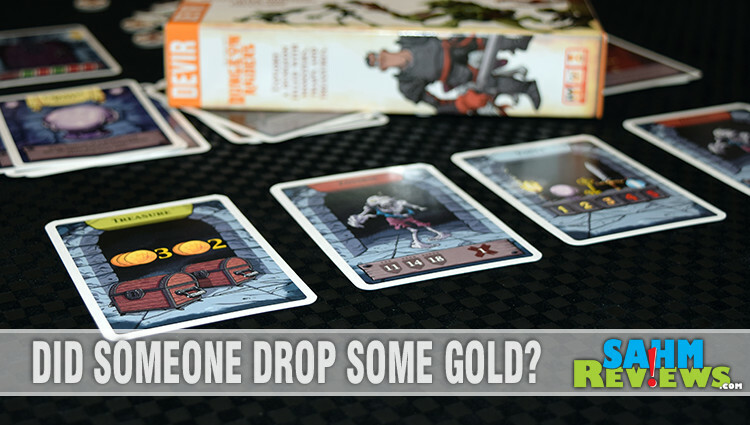 Among the party members left standing, the person with the highest total of gold is declared the overall winner! And if there are ties for the most coins, the person with the fewest wounds wins. If still tied, they share in the victory! Dungeon Raiders was originally published in 2011 and has been reissued this year with updated artwork and streamlined rules to keep all players in the game until the end. 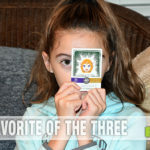 One of the first published games by designer Phil Walker-Harding, you might know a few of his other games – Sushi Go, Imhotep and our favorite engine-builder game, Gizmos! You’ll find your copy on Amazon for under $25 or at your favorite local game store. Want to be the first on your block to run through Dungeon Raiders? 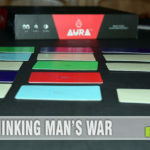 Enter to win your own copy direct from Devir Games by entering the contest below! Don’t forget to come back each day for additional entry opportunities! I think I would rather have the key to get the loot. Maybe then I could buy or trade for the sword. I’d rather have the key. I think I’d like the sword. The more monsters you kill the more loot is dropped, at least in DnD. Loot is always best! I’ll take the key. Sword. Loot is useless if you can’t fight your way back out…. The sword! How can you enjoy loot if you’re dead?? Sword to Kill more Monsters! I’d rather have the sword. Getting the loot then dying won’t do me any good! I’d rather have the key. Get in and out quickly, before the monster see you. I’d rather have the sword…because those monsters are always guarding the loot & blocking your path! I can run away or hide from the monsters, so I’ll take the key, please. Thank you for the fun giveaway. I’ll take the key for the loot! I would rather have a sword. Loot! give me the key! I would rather have a key that helps me get loot. In every dungeon you go in everyone must bring a Wabbajack with them it is the most effective dungeon weapon of all time.